This day was all about superhero glasses and super vision. The boys loved the first activity of the day which was making these red and blue spy glasses. 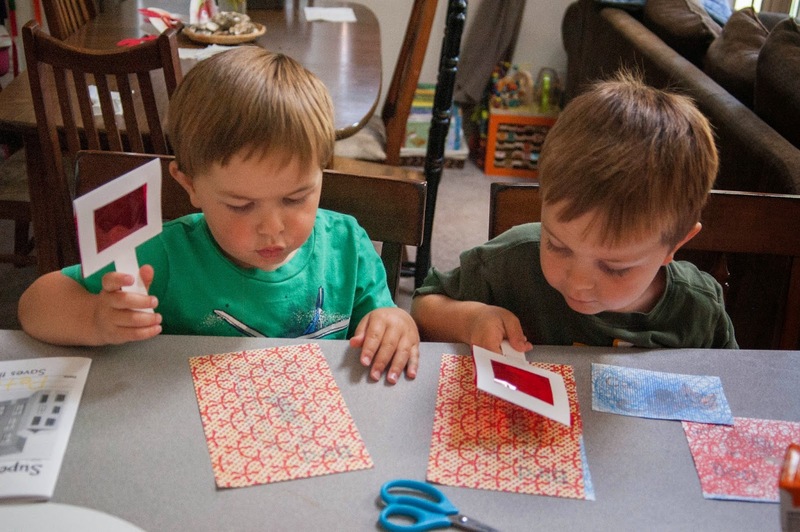 First Mother Goose Time had us ask, what is your favorite color? Peter said green and Lachlan said red. The spy glasses were made with red and blue cellophane. When they put them over the provided papers, pictures were revealed. On the paper hand out they gave us there were three pictures covered by a pattern or scribbles. So there was a blue picture with red scribbles over it and when the red cellophane spy glass was placed over it the blue picture underneath all of a sudden became clear. This was thrilling to my boys and they played with them for several days. They brought them with to different outings to show their friends and cousins. One of the places he took his spy glass to show people was to the homeschool co-op we are part of. They made these really cool pencils there and when we got home he wanted to use that pencil to write his name on his spy glass. This is the first time he wrote his name with out tracing it or copying it. He actually spelled it out to write it. Here is the back story on how we got to this wonderful event. 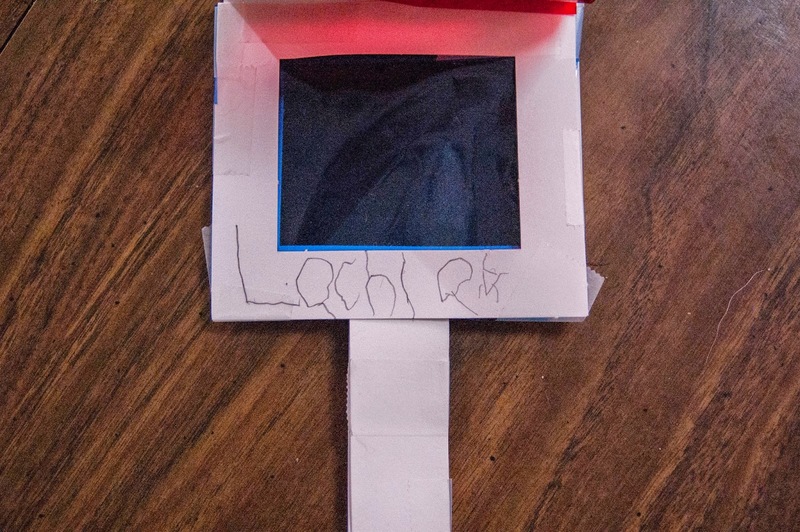 A couple months ago Lachlan went to his 5 year well child visit. The doctor asked him if he could spell his name, and he could not. 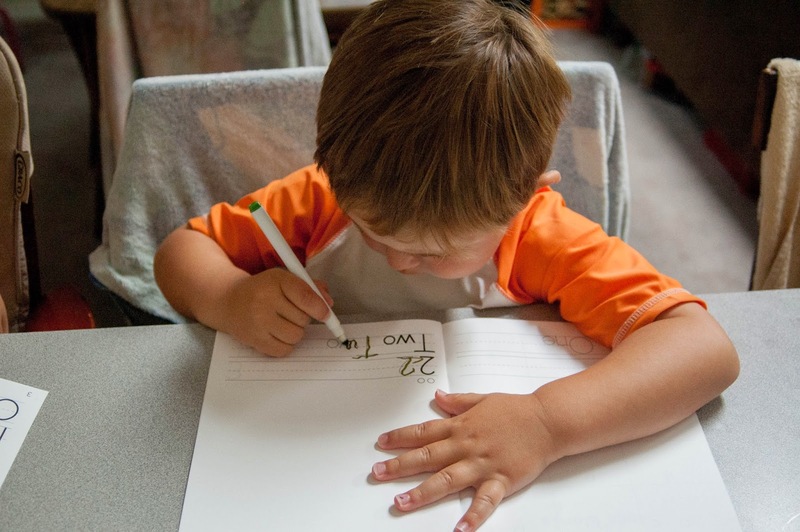 Honestly, I am new to all this and I figured he would learn it as we go, as we write it and as he learns his letters. I figured he would put it all together. Then I realized, he probably could just memorize it so that he could tell people when they ask. I still wasn't sure if I liked that idea because I would rather he actually know it. But none the less, I started teaching him. I actually taught him in a rhythm. I would clap twice and say L-A, then clap twice again, C-H, then clap three times L-A-N. That way, I could stop saying the letters and just clap the rhythm and then he could take it from there. He quickly picked it up. It was a few days later we were at co-op and one of the other Moms asked him how to spell his name. He looked dazed for a second and then I reminded him by saying L-A and clapping twice. He continued from there and spelled his name for her. He was beaming with pride. When we got home and he wanted to write his name, he used his newly refined skill of spelling his name. He would spell it and then recall what those letters looked like and wrote his name! So it turned out that just memorizing the letters in his name was not so bad after all. Because he memorized it he was able to write it all by himself. Every little accomplishment like this is a big deal for Lachlan. He is a perfectionist and doesn't want to do anything unless he can do it himself and do it right. He gets really upset if I directly try to instruct him. 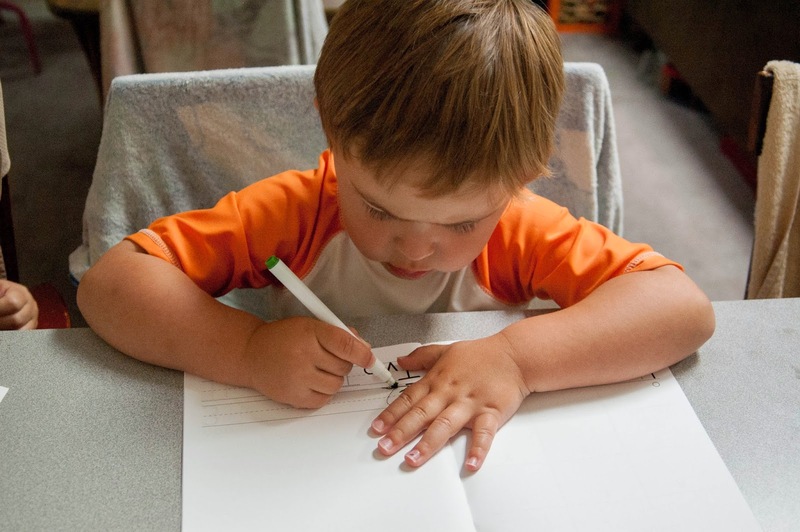 So to simply memorize his letters helped him to be able to write his name, by himself. The added boost in confidence helps too. Makes him more willing to try new things. I am so pleased that this worked out as it did. 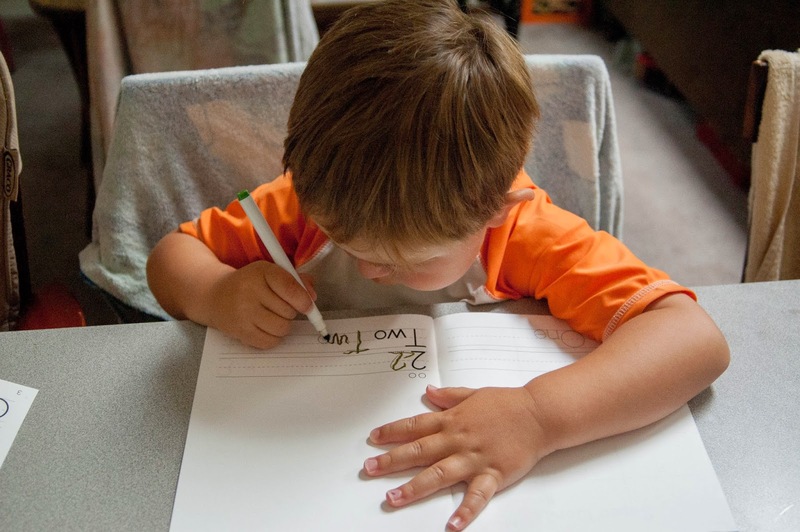 Writing his name falls in the skill category Emergent Writing 14.1 Writes name, words and sentences. He probably fits most comfortably at Benchmark D but he has now accomplished the first 2 parts of Benchmark E, Prints first name. Copies print. Uses inventive spelling. I need to figure out what inventive spelling means, but I can take a guess and I don't think he is there yet. I bet we are close to that stage though. I was so excited that he was writing his name and was praising him of course. This made Peter want to join in and I have learned never to underestimate Peter. I have to remind myself that Peter is only 3.5 years old. 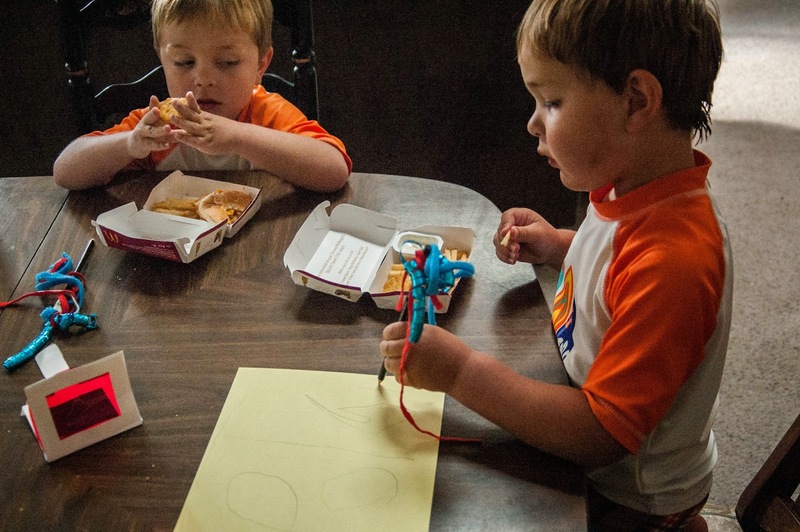 Here they are using their new pencils they made at the 4th of July co-op. 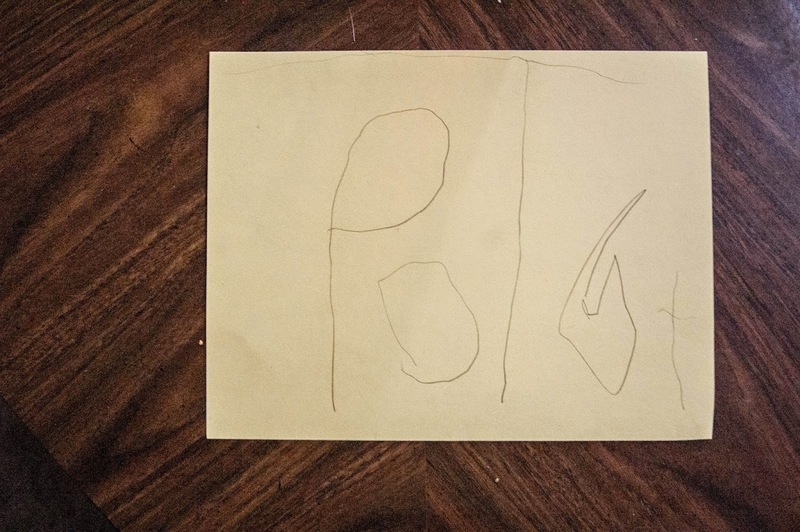 This is Peter writing his name. This again was from his memory. He was not copying his name. We were spelling it together and he wrote it out. He has been pretty good at P for a while. 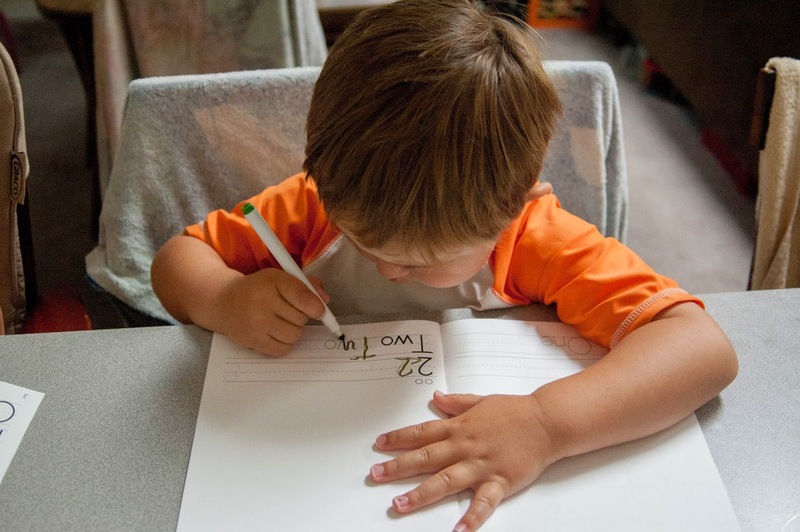 T he figured out a while ago because it's Mommies letter and he likes to write it and point it out when ever he sees it. The Es and R he did to the best of his recollection. I am very impressed by my little man. He has been joining in on school with Lachlan since he was 1.5 years old. 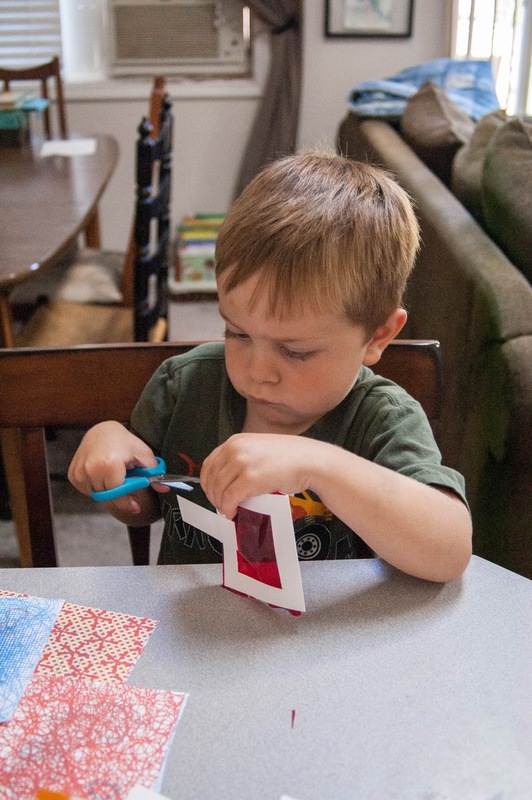 I never would have thought to start that young, I didn't start anything like this with Lachlan until he was 3. So if you are wondering when to start using Mother Goose Time with your children, I recommend 1 and a half. Seriously, they have so much fun, they don't know they are learning and it provides some awesome moments between you and your child. What I am really enjoying about this month is that because it is a review month, everyday we are working in our My Little Journal. Each day we write a number and do an activity associated with that number. Day 2 was all about glasses so we drew 2 eyes. Peter is tracing the number 2 here. Lachlan, again in his swim trunks, is drawing the 2 eyes I asked him to draw. He is drawing a few sets in fact. 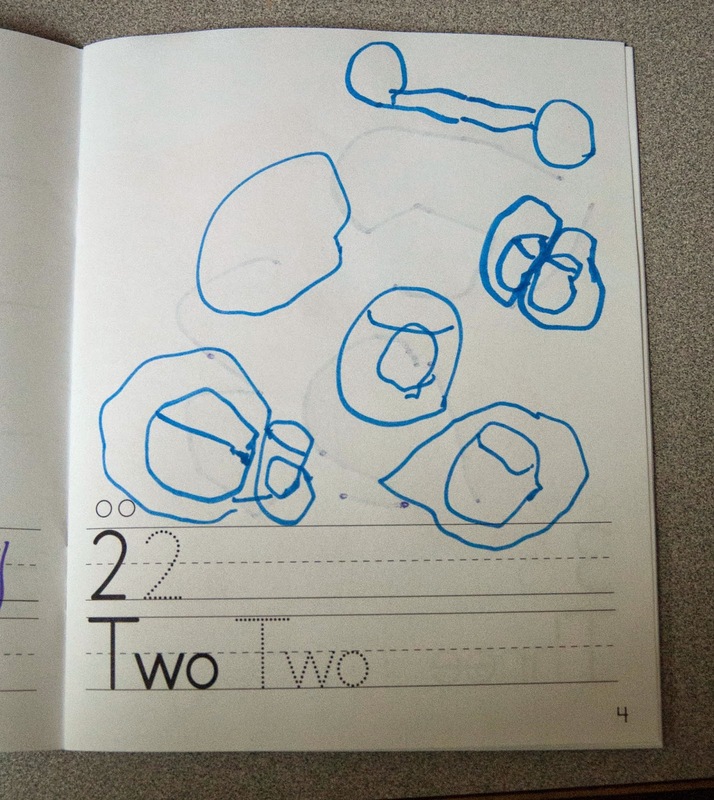 Here is Peter tracing the word "two". 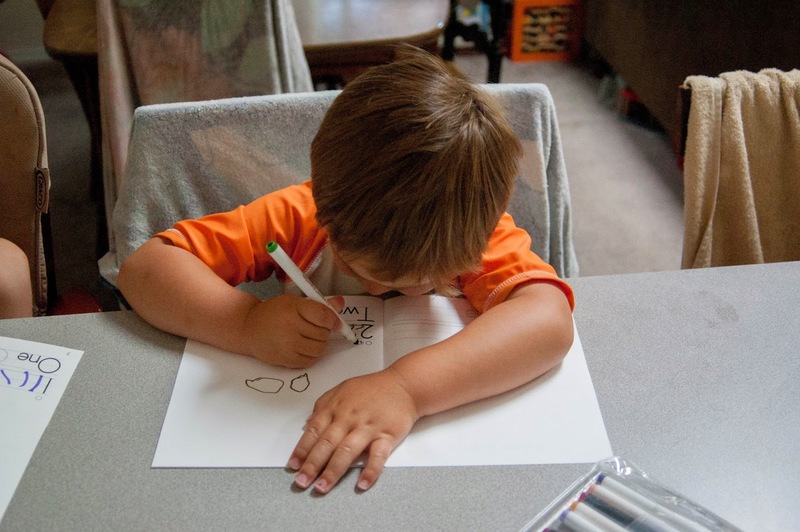 As he writes the letter W I just kept clicking and you can see his hand going up and down tracing the letter. He really enjoys coloring in the little dots they have on the page too. For each number they have the correlating number of dots on the page for the kids to count. Another way for them to figure out what number is on the page in case they don't know it by looking at it. Here is Lachlan's finished page. Multiple sets of eyes. I asked him to draw glasses around one of the sets of eyes but I don't think he could quite visualize it. So he drew a pair in the upper right hand corner.